Chances are that if Mrs. Mary Caroline Kelly had not given testimony at the trial of Lizzie Borden, her husband, Michael F. Kelly and their home next door to the Borden’s house on Second Street would have been forgotten by now. The little Cape Cod-style home, which has had many additions over the years since it was constructed, still stands, now painted a buttery yellow, much as it was when the Kellys moved there in 1891 after their wedding . It is the only residence remaining on Second St. between Spring and Borden streets from the days of the Borden crimes. All else has met with the wrecker’s ball. The stores attached to the house and the house itself are again for sale now. At one point, in the early 1990’s the Kelly house was a bed and breakfast, long before the Borden house became such a business- and it was called “Lizzie’s B&B”. 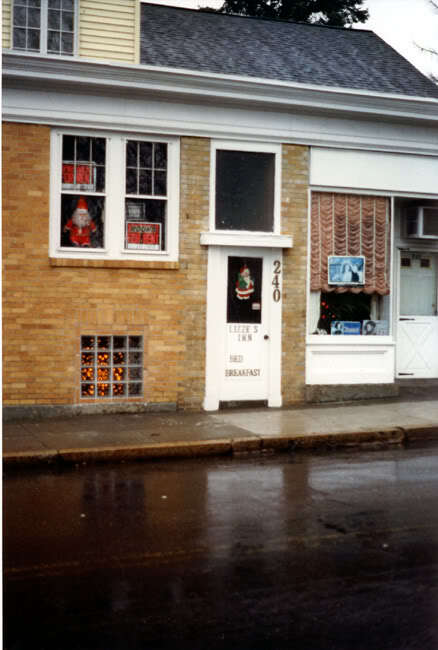 What is even more remarkable, the Kelly’s second home at 255 Third St. was also called “Lizzie’s B&B” and boasted a large hanging sign out front. The second Kelly home, also still standing and notable for its enormous size and brown shingles, sits directly behind the first Kelly home. Moving was a simple matter of crossing the back yard. There are conflicting dates as to when the second house was built, either 1897 or 1899. The Kellys with their children Christopher, Eva and Mary Philomena appear in the 1900 census with their seventeen-year-old English maid, Miss Austen at 255 Third Street where the family lived until the house was sold to Thomas Phelan four months before Dr. Kelly passed away at the summer home in Tiverton, Rhode Island. In the years between 1890 up until his death at age 60 in July of 1916, Dr. Kelly would build a career rich in community spirit, compassion for the poor, and service to the city and his church, St. Mary’s now St. Mary’s Cathedral on Second Street, just across the street from the Kelly home. Michael Kelly’s life was the American dream for which many emmigrants left the old country to follow. His dream was realized in full and passed on in the lives of his children. Michael Kelly was a scholar plain and simple. He loved learning and books. Born in Ireland in April of 1856, he and his family sailed to America in 1870 from Ireland. Margaret and William Kelly were brave to make the crossing with six children: Michael, the eldest (1856), Julia (1860), Patrick (1863), John (1866), Edmond (1868) and Thomas (1870). Another two daughters, Bridget and Sarah, birth dates unknown, were born to the couple. 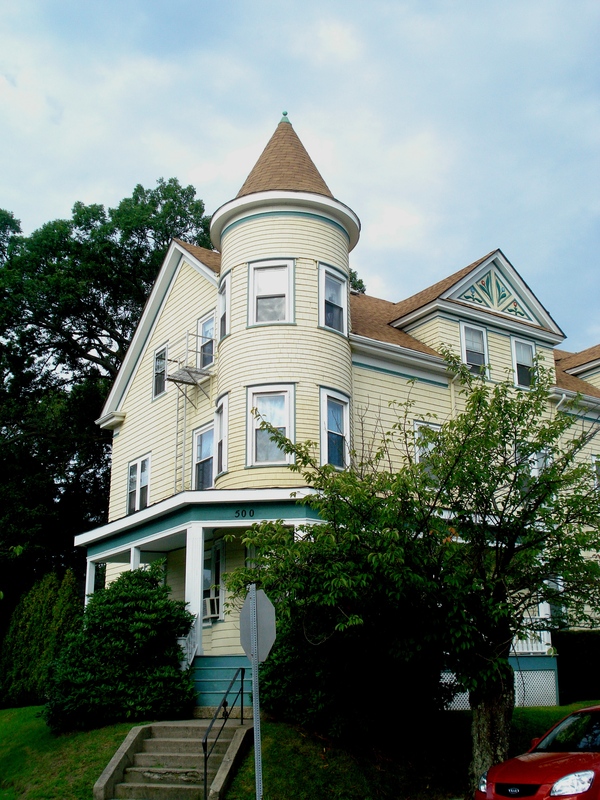 The 1880 census has the large family living at 27 Union Street in the heart of Fall River. William Kelly found employment at the Print Works, Julia and John in the cotton mills while Pat went to work as a barber’s apprentice at the age of 17. The two youngest were at school and Michael Kelly is listed as a student ( just having graduated from Holy Cross Class of 1879)). The Directory of Deceased American Physicians 1804-1929 lists Dr. Kelly as finishing his medical studies at Bellevue Hospital Medical College in 1885, being awarded his M.D., and returning to Fall River to assume duties at Fall River City Hospital, Union Hospital, St. Vincent’s Orphans Home and the Seaside Home for Sick Children. He also was a tireless volunteer at St. Anne’s and several nurses training schools in the area, lecturing and advising. Mary Philomena was born in 1894 followed by Eva J. in 1897. Holy Cross awarded Kelly an honorary Masters of Arts Degree in 1896. A smallpox epidemic ravaged the city in 1899 and Dr. Kelly spearheaded the effort to bring the epidemic under control, losing only one of his 60 cases. By 1900 the census has the Kelly family in their new home at 255 Third Street, directly behind the yellow cottage where the newlyweds had begun married life. Eva Kelly Betz became a school teacher in Rhode Island and then in Fall River while writing poetry, plays and one-act plays for children in her spare moments. She would follow in her father’s footsteps and become civic-minded, organizing the Community Chest, local Girl Scout troops, the local chapter of the National Council of Catholic Women and a driver for the AWVS during WWII when she and her husband, lawyer Joseph Betz lived in Passaic, New Jersey. After the war, Eva Kelly Betz wrote popular books for teens and enjoyed a happy family life with her husband and son Peter until her death in 1968. All are buried with Dr. Kelly at Saint Patrick’s Cemetery in Fall River. The middle child, Mary Philomena, called Philomena, married Bertrand K. Hart, grandson of Abraham Gifford Hart, a pallbearer for Andrew Borden. Abraham Hart, treasurer of the Union Savings Bank had something in common with Caroline Kelly, both were among the last to see Andrew Borden alive. 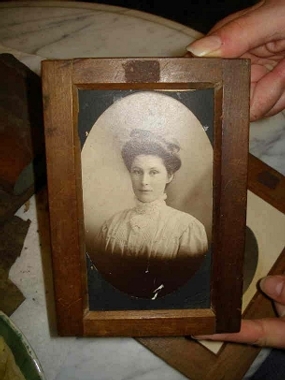 Mrs. Charles S. (Clara) Hart, like Mrs. Kelly, gave birth to a son in 1892. Mrs. Kelly’s only son Christopher, Mrs. Charles Hart to only son Bertrand K. Hart who would grow up to marry Dr. Kelly’s daughter Philomena. They are buried in the Hart plot at Oak Grove Cemetery just across from the Rev. 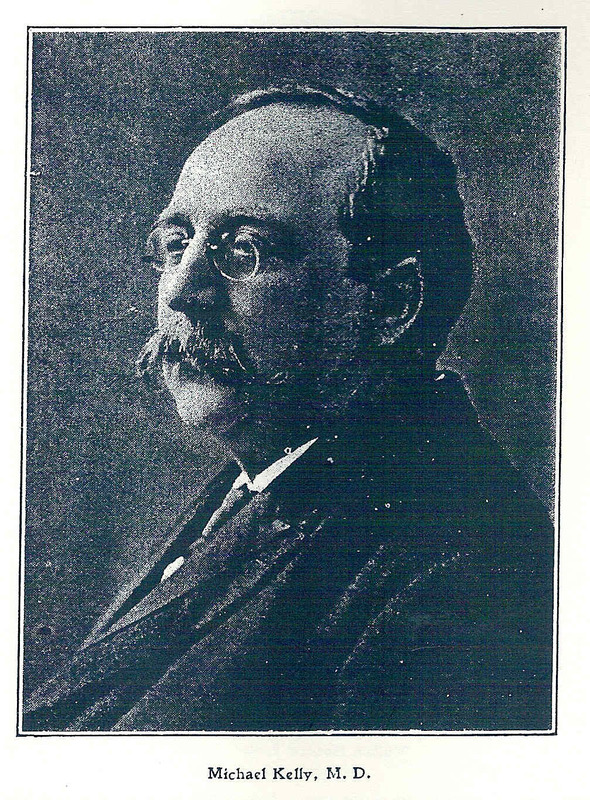 Augustus Buck, Lizzie’s Congregational Church champion throughout the trial. 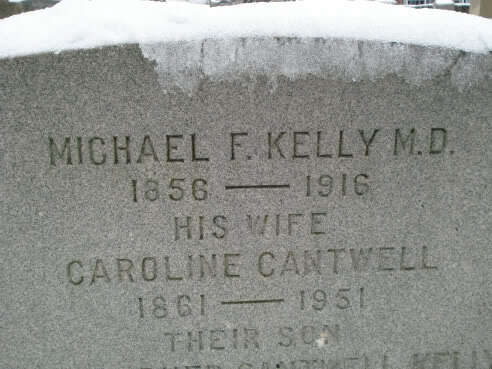 Dr. Kelly’s only son Christopher Cantwell Kelly pursued a career in real estate and insurance with an office in the Granite Block and died tragically young at age 27 of tuberculosis, in Fall River, only three years after his father died. 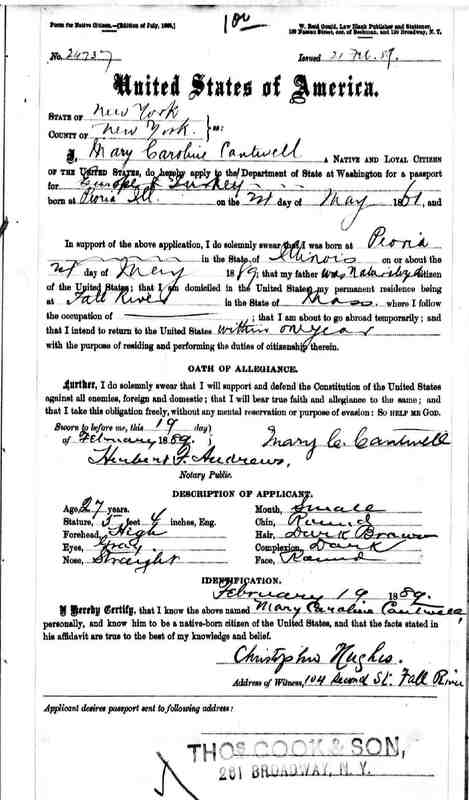 His 1917-1918 draft registration lists him with black hair and gray eyes, and still unmarried. He was in the Navy. When Michael Kelly died on a Friday, July 28, 1916 as WWI raged on, after suffering a long illness and several days in a coma, the city mourned a friend and unstinting servant of the poor. The list of his accomplishments was long and distinguished: Fall River Medical Society, American Medical Association, Massachusetts Medical Society, Knights of Columbus, Fall River Board of Health (two three-year terms), Fall River City Doctor, Ancient Order of Hibernians, The Clover Club, President of the United Irish League, the American Historical Society, and an enthusiastic organizer of the annual Fall River Saint Patrick’s Day celebration. “Love of native land fired the soul of the physician. As a champion of the cause of Ireland, he was heard from often both by pen and tongue and in the more practical way of contributions. When in health he was a leader of movements for the observance of the feast of the patron saint of the Emerald Isle. No occasion of the kind was allowed to pass without Dr. Kelly being demanded by enthusiastic observers. At one celebration he responded so wittily to the toast “The Ladies” as to surprise his closest friends by his display of eloquence and lightness. His one diversion in hours of leisure which he extended far into the night , even after a day of hard work, was to sit in his library and commune with the spirits of the great writers. He was an omnivorous and discriminate reader. He was modest in the extreme as regards himself.” (Fall River Evening Herald July 29, 1916). It was said that not an Irish politician came through town but that put his feet under Dr. Kelly’s diningroom table at the sprawling house on Third Street. A strong advocate of Home Rule for Ireland, Kelly became personally acquainted with every leader of note in Ireland and America. As his eyes closed at last at 8 p.m. on that Friday evening in the summer house on Main Rd. 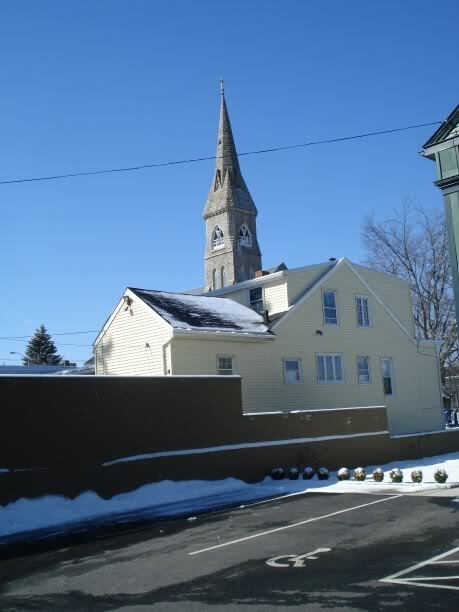 in Tiverton, Rhode Island, Dr. Kelly had rest at last after struggling with ill health for three years. His Requiem after Mass at 9 a.m. on Monday at St. Patrick’s was packed to the rafters with people from all walks of life. Gone at the age of 60, many would mourn that he had worked himself to an early grave; to the poor he was like a saint on earth. For his grieving family, life would never be the same. 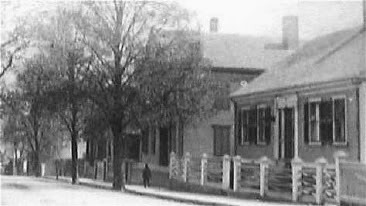 His three children and Caroline moved to 500 Weetamoe Street in the north end of the city, the big house on Third Street having been sold in February 1916, its spacious rooms which once rang with laughter, silent. Philomena worked as a librarian and Eva taught school until her marriage. Caroline would leave Fall River and make her home in New Jersey with Eva and her grandson, Peter Betz. Philomena Kelly Hart once recalled her mother’s part in the Borden story and how she was told how the women, including Irish maid Mary Doolan, her grandmother, Mrs. Cantwell, and Caroline locked up the house and peered out from behind the blinds on the day of the murders while police rampaged around the yard, waiting for Dr. Kelly to return home from his day trip. Eva never referred to the incident. The last Fall River Kelly House at 500 Weetamoe St. at the corner of Robeson. 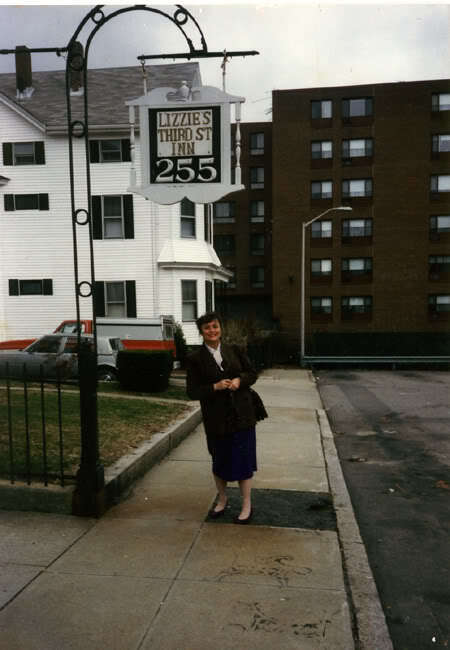 Today 255 Third Street is again a one family home, filled with six children- bright and filled with life. The little yellow Cape on Second Street is rented out to a bustling family with many young children. Dr. Kelly would approve. 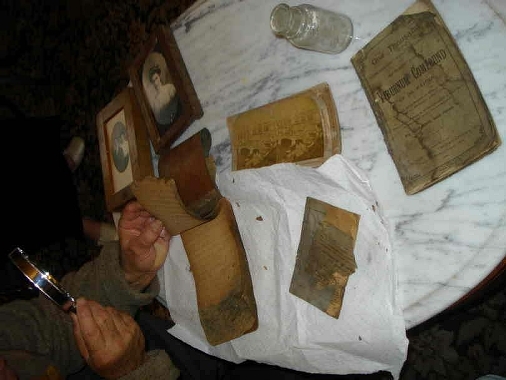 The three photos above are items found inside the walls of the second Kelly home at 255 Third Street by the current owner during remodeling. 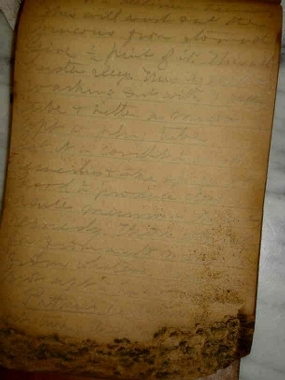 The notebook contains notes of a medical nature and may well have belonged to Dr. Kelly. This house was also at one time Neale’s Boarding House. Today sinks are still found in every bedroom of the large home from its boarding house days. Special thanks to the Tavares and Lamont families who currently live in “Kelly Houses” , and also to the lovely mother and daughter who live in the last Kelly house at 500 Weetamoe at Robeson. Also thanks to the staff at Saint Patrick’s cemetery for help in tracing the cause of death of Christopher Kelly. Thank you Shelley for this wonderful article. Fall River was lucky to have such a dedicated physician and scholar. It is amazing how people involved, even by coincidence or geography, would not talk about the Borden murders. Well, you’ve done it again ,Shelley. You’ve managed to bring to life through your distinguished prose another person we all have heard and ,perhaps ,even read a little about. You have given him heart and soul which makes him a ” real ” person not just a side note in the tragic Borden Saga. Thank you! Another fine job, Shelley. Very intriguing.